Every time I drive up Montebello Road to Ridge Winery I pass by this awesome cactus plant outside one of the local elementary schools. 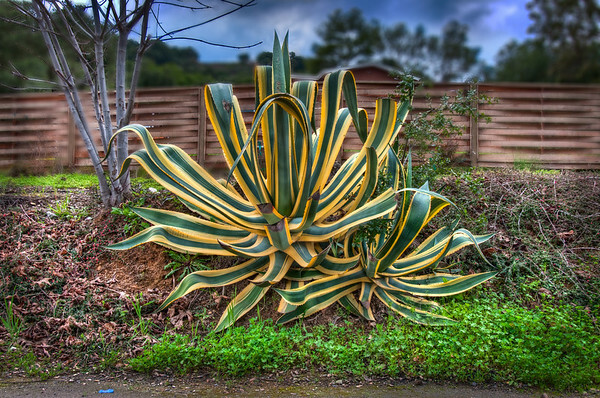 I've always wanted to stop and snap a couple pictures of this plant but it was always night time. Finally, now that the days are lasting longer, I was able to bring my camera and snap a couple photos of this super neat shaped plant. I really should take a video of this plant because one angle does not do this justice. I tried walking around and taking different angles but I liked the background in this angle best. Not many people know that one of the best wineries in California is not actually located in Napa Valley, but rather, 2 hours south in Cupertino. I've been a wine-club member of "Ridge Wine" for about 6 months now and I absolutely love their wine. To get to their Montebello Winery you drive up Montebello Road in Cupertino, a very narrow (1 lane in some spots), windy road that overlooks the entire Silicon Valley. The first Friday of every month they hold an even where we get to taste wine (free for members) and pick-up our wine. 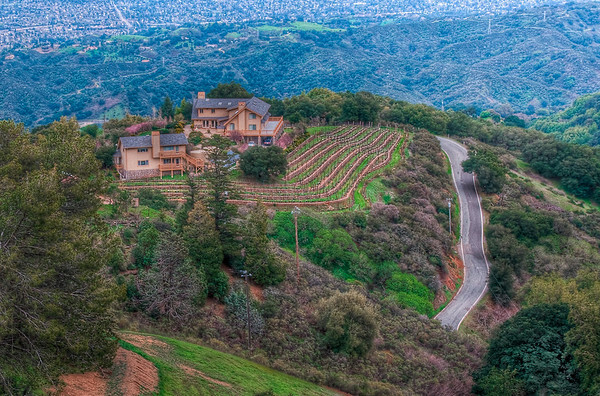 I brought my camera, tripod and snapped this picture of the vineyards/Silicon Valley below. I couldn't decide which cropping I liked better, so I showed this zoomed in version and then a (further out) one (see next). 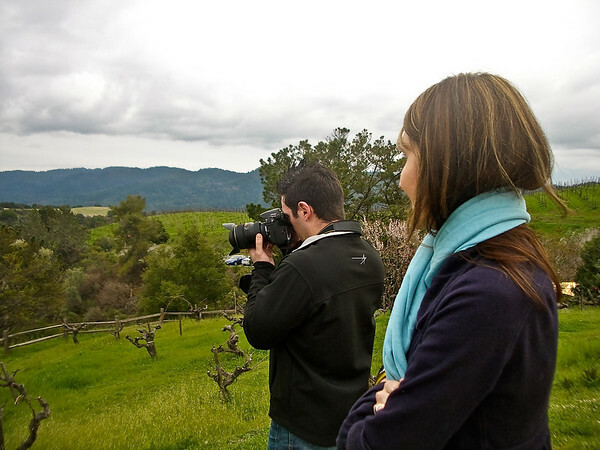 Not many people know that one of the best wineries in California is not actually located in Napa Valley, but rather, 2 hours south in Cupertino. I've been a wine-club member of "Ridge Wine" for about 6 months now and I absolutely love their wine. To get to their Montebello Winery you drive up Montebello Road in Cupertino, a very narrow (1 lane in some spots), windy road that overlooks the entire Silicon Valley. 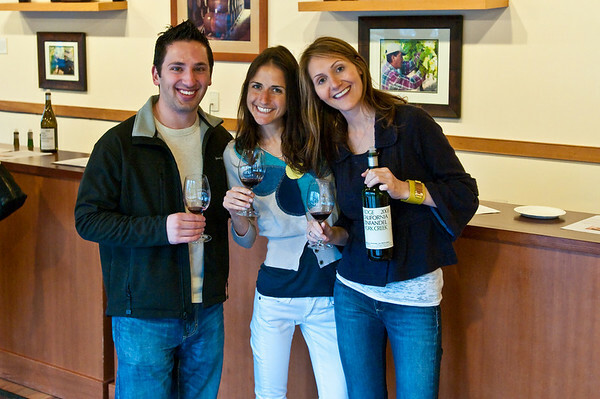 The first Friday of every month they hold an even where we get to taste wine (free for members) and pick-up our wine. 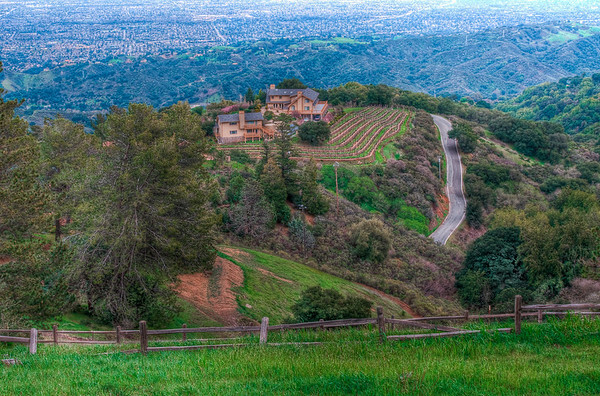 I brought my camera, tripod and snapped this picture of the vineyards/Silicon Valley below. I couldn't decide which cropping I liked better, so I showed this (further out) one and then a zoomed in version (see previous) of the vineyard. Rachel has an inside joke from a trip she took in which a photographer friend told them that their pictures would turn out better if they gave "Swan Neck" face. 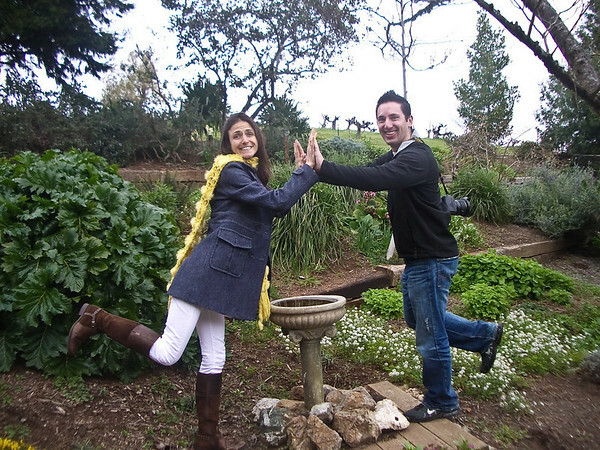 Here, Rachel and Mishkie demonstrate while enjoying some wine at Ridge Winery. 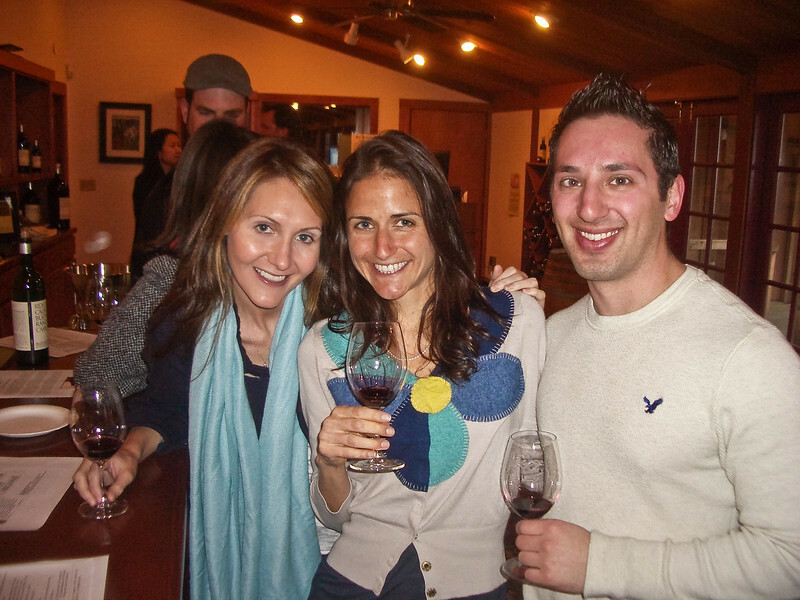 Aaron, Mishkie and Rachel enjoying our wine tasting experience at Ridge Wineries March 2010 First Friday event! Photo of me taking photos! 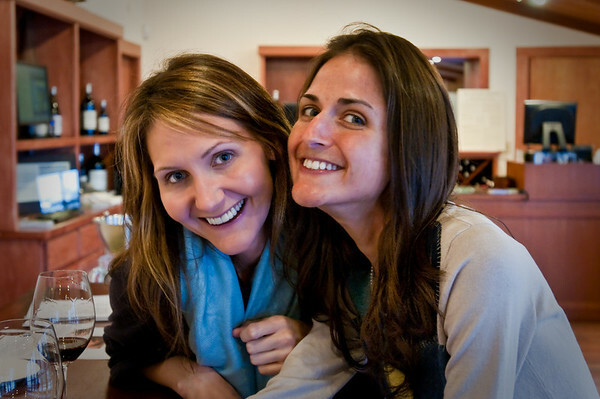 Not many people know that one of the best wineries in California is not actually located in Napa Valley, but rather, 2 hours south in Cupertino. 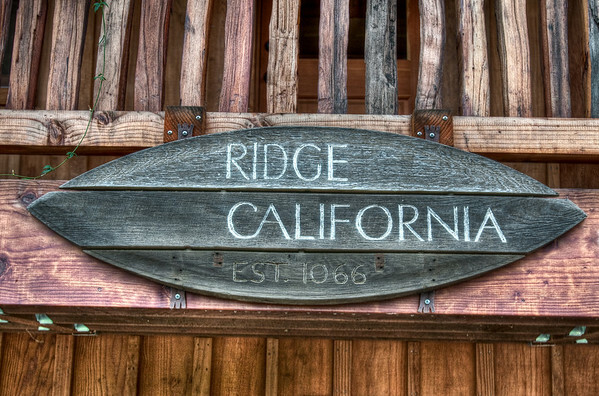 I've been a wine-club member of "Ridge Wine" for about 6 months now and I absolutely love their wine. 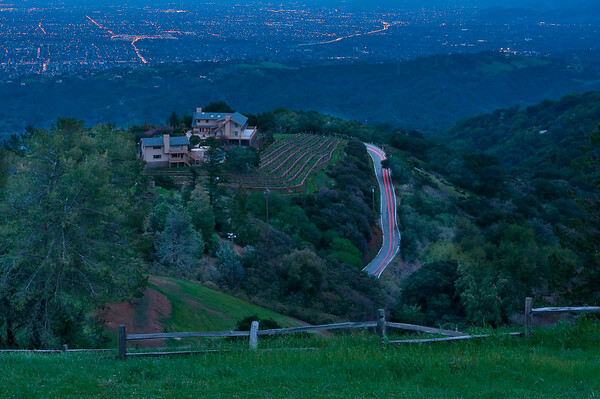 To get to their Montebello Winery you drive up Montebello Road in Cupertino, a very narrow (1 lane in some spots), windy road that overlooks the entire Silicon Valley. The first Friday of every month they hold an even where we get to taste wine (free for members) and pick-up our wine. 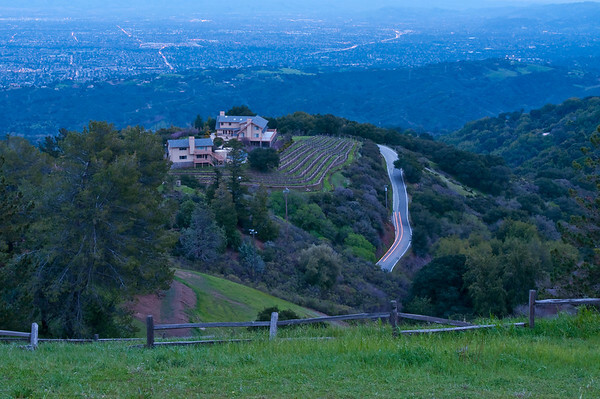 I brought my camera, tripod and snapped this picture of the vineyards/Silicon Valley below. After wine tasting for a bit I decided it was starting to get dark enough to take my tripod back out there and see if I could shoot some photos with cars lights going through it. It wasn't dark enough and I couldn't get long enough exposure (I left my ND filters in the car, mistake!). Anyways, this was attempt #2. I wanted to make the car lights go all the way through the road so I had to photoshop some more light trail in and it ended up coming out *really* bad (fake) looking. Oh well.